Please fill in this contact form if you have any questions regarding trails on the Sunshine Coast, you have something you'd like to share, you've noticed a problem on the site or you'd just like to say hello! I look forward to hearing from you. Click here to return from this contact form to the Sunshine Coast Trails Home page. 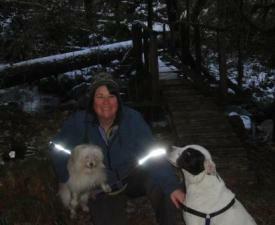 My dogs and I take a break for a photo op while hiking in Sprockids Park in Langdale. Maybe you can tell, it was a cold day in February.